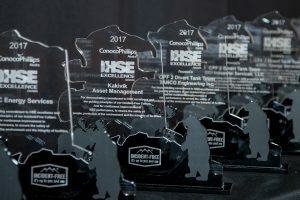 Anchorage, AK – Kakivik Asset Management and CCI Industrial each received the ConocoPhillips HSE Excellence Award as recognition for demonstrating a commitment to HSE excellence and embodying the guiding principles of the incident-free culture at ConocoPhillips Alaska. Kakivik’s HSE award recognizes the company’s core value of safety and the incident free culture that is closely aligned with that of ConocoPhillips. It also reflects Kakivik’s recent achievement of its six year and more than 2.5 million man-hours of working without an OSHA Recordable Incident for ConocoPhillips in Alaska. This is the fourth such award Kakivik has received from ConocoPhillips in the last six years. CCI was given their award along with several other contractors for collaborating as a team to complete the CPF 2 Divert Tank repair work scope earlier this year. The award also recognizes CCI’s overall continuous improvement in HSE performance to ensure the safety of people, protection of the environment, and the integrity of [the client’s] facilities.